The only problem is that heating up food in your dishware means having to pick up a hot dish, and it seems a bit overkill to use an oven mitt for a cup. The fine people at Joseph Joseph must have been annoyed by this situation too, as they created a solution. 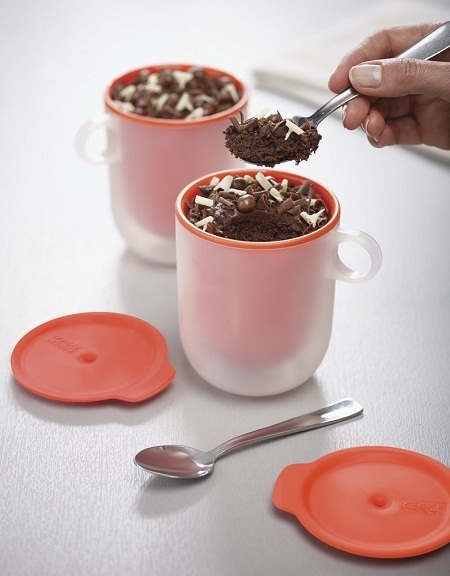 This Cool Touch Microwavable Mug Set is everything you could want for heating up soup, drinks, stock, or making desserts. The main deal with this set is that they are double-walled, and have a frosty clear plastic exterior that won’t burn your fingerprints off after being heated for a few minutes. These come with lids for liquids so that heating doesn’t mean you’ll be dealing with explosions, and are relatively inexpensive at $11.40 for the set. They have a 12 ounce capacity, and can be tossed in the dishwasher safely. The only foreseeable downside is that a hot mug is normally a source of warmth during these colder months, and this double-walled construction is built to keep the heat on the interior, depriving your hands of temporary relief from chillier temperatures.